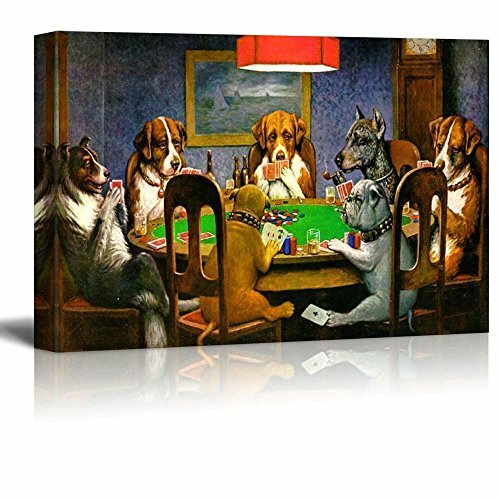 wall26 - Pokers Dogs by C. M. Coolidge - Canvas Art Wall Decor - 16"x24"
Back frame was broken, other than that good. Im so pleased with this picture. Reminds me of the tapestry we had as a kid. For the price, the picture is great! But the seller misrepresents what is included. The descriptions states "Hanging Accessory Included" and a picture of the hardware is shown. Yet no hanging hardware is included, nor is any hardware attached to the picture. For the price, no big deal. But the seller should be truthful and not state something is included when in fact, it is not.